Be the first to share your favorite memory, photo or story of Verda. This memorial page is dedicated for family, friends and future generations to celebrate the life of their loved one. 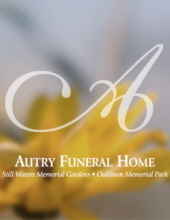 A private service for Verda Loftin, age 101, of Jacksonville, is scheduled at 3 o’clock in the afternoon Wednesday, February 6, 2019 at Autry Funeral Home Chapel in Jacksonville. She will be laid to rest at West Shady Grove Cemetery in Jacksonville. Chaplin Don Barron will officiate. Verda was born June 1 ,1917 in Jacksonville to Charley and Mary (Kassler) George. She passed away Sunday, February 3, 2019 in Jacksonville. She worked for Nichols-Kusan in Jacksonville for many years and enjoyed quilting. Verda was preceded in death by her parents and husband, D.M. Loftin; a grandson, Jimmy Hilty; five brothers and four sisters. Left to cherish her memory is her daughter, Helen Hilty of Jacksonville; brother, Neil George of Irving. She is also survived by her grandchildren, Phyllis Watson and husband Jimmy, Beth Martin and husband David and Philip Hilty and wife Susie; 10 great-grandchildren; 12 great-great grandchildren; one great-great great grandchild; and numerous nieces and nephews. Pallbearers will be Jimmy Watson, Brian Hilty, Randy Watson, Robert Hilty, Casey Hilty, Orry Kirkland and Leon Villarreal. "Email Address" would like to share the life celebration of Verda Loftin. Click on the "link" to go to share a favorite memory or leave a condolence message for the family.